NEW YORK -- A New York slice of pizza usually goes for around $2.50, but what does a pie that goes for $2,000 taste like? You can find out at Industry Kitchen at 70 South Street. 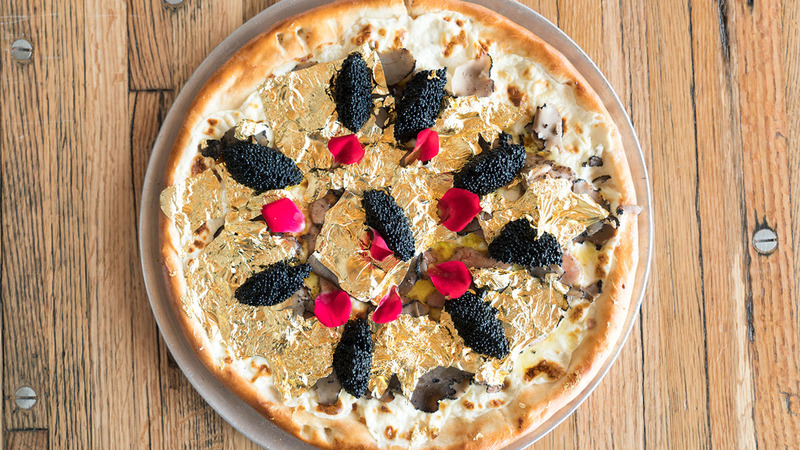 The restaurant's Wall-Street inspired pizza is topped with rich (literally) ingredients from around the world: caviar (Caspian Sea), truffles (France), foie gras (France), Stilton cheese (England) and yes, 24-karat gold flakes (Ecuador). "I drew my inspiration for the pizza from the Financial District, which is right next door to where we're located," Chef Braulio Bunay said. "This area attracts people from all over the world, so I wanted to create a dish that celebrates that." Bunay set out to "transform the usually humble pizza into a luxury dish" and with that goal in mind, customers who want a bite have to order the pizza 48 hours in advance. The item has been on the menu since November.